I love church history. Like most leaders in the Reformed Protestant tradition, I'm excited about next year's 500th anniversary of the Protestant Reformation. Whether you are Protestant or not, this is an important milestone in the history of the world and one for which you should be thankful. But that's next year. What about this year, 2016? This year is the 500th anniversary of another vitally important event, one which is perhaps more important because it was even more foundational and transformational than the 95 Theses. So, on this Reformation Day 2016, I offer the following thoughts on the road to the Reformation and the culminating event which happened in 1516 . . . The Middle Ages are sometimes known as “The Dark Ages.” The time from the fall of Rome in 476 AD to the dawn of the Reformation in 1517 is often characterized as a time of ignorance and brutality. Much of this characterization is unfair and inaccurate, but it is sadly true that the light of the Scripture was almost completely removed from the church during much of this time. How the Scriptures were kept from God’s people and how they were later restored is a vitally important story, as it shows the long struggle and the great sacrifices made to ensure that we have Bibles in our language today. The story begins in the year 382 and it culminates in many ways with an event which happened 500 years ago this year. Next year, 2017, is the official 500th anniversary of the beginning of the Protestant Reformation, when Martin Luther nailed his 95 Theses to the church door in Wittenberg, Germany. But I would argue that what happened the year before, in 1516, was actually more important. But, as I said, our story begins in 382. Around the year 382, Jerome made an updated Latin translation of the Bible, which would later become known as the Vulgate, or the commonly-used translation of the Bible. Ironically, given what would happen later with this translation of the Bible, Jerome’s goal was to make an updated Latin Bible that people could more easily understand. 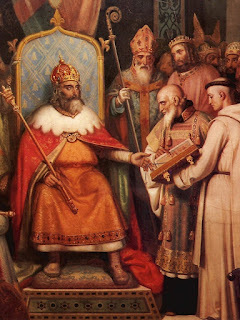 Fast-forward 400+ years (painful but necessary in a blog post): On Christmas Day in the year 800, Charles the Great, king of the Franks, known to history by his French name, Charlemagne, was crowned by Pope Leo III as the Holy Roman Emperor. Charlemagne controlled most of Western Europe in an empire that included most of modern-day Germany and Austria, all of Switzerland, France, Belgium and the Netherlands and parts of Italy and Spain. Charlemagne’s influence was enormous, as he valued education and established schools across his empire. He was perhaps the single person most responsible for making Jerome’s Vulgate the dominant Bible of the Roman Catholic Church. Sadly, even by 800, almost no one in Europe, including most priests, understood Latin very well. Many could not even pronounce the words properly and very few understood what they were reading. None of the lay people did. 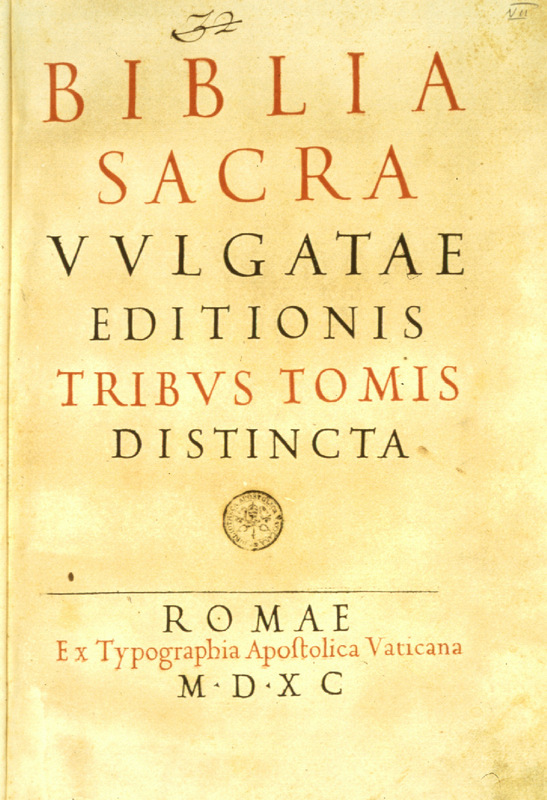 For hundreds of years, Latin continued to be the language of the church and the Holy Scriptures across Europe. 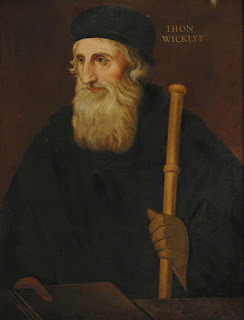 Almost the entire medieval church lay under the dark shroud of ignorance and corruption with no access to the Scriptures, until John Wycliffe came onto the scene in England. Wycliffe earned his doctorate in 1372 and began pastoring in 1374. Wycliffe dared to challenge the corruption and abuses in the church, and he claimed to do so on the basis of Scripture. Wycliffe boldly asserted that Scripture was the supreme authority for the Christian and that the pope and the church were secondary, subject to the Scriptures. In 1382, Wycliffe completed a translation of the Bible from the Vulgate into English. This was the first translation of the whole Bible into English, and Wycliffe had help completing it. It was later updated in 1388 and 1395 and remained very important in England. Wycliffe himself was condemned as a heretic by the Catholic Church. The Pope called him “the master of errors” and issues 5 Papal Bulls (church edicts) against him. Wycliffe taught many of the doctrines later taught by Martin Luther and the Reformers, only he taught them 135 years earlier. Wycliffe wrote against the doctrine of transubstantiation: "The bread while becoming by virtue of Christ's words the body of Christ does not cease to be bread." He challenged indulgences: "It is plain to me that our prelates in granting indulgences do commonly blaspheme the wisdom of God." He repudiated the confessional: "Private confession … was not ordered by Christ and was not used by the apostles." He reiterated the biblical teaching on faith: "Trust wholly in Christ; rely altogether on his sufferings; beware of seeking to be justified in any other way than by his righteousness." The church bitterly opposed his Bible translation work, saying: "By this translation, the Scriptures have become vulgar, and they are more available to laymen, and even to women who can read, than they were to learned scholars, who have a high intelligence. So the pearl of the gospel is scattered and trodden underfoot by swine." Wycliffe replied, "Englishmen learn Christ's law best in English. Moses heard God's law in his own tongue; so did Christ's apostles." Wycliffe died in 1384, before the final version of his Bible translation work was complete. He also died before the church could actually convict him of heresy and execute him as a heretic. So, more than 30 years after his death, the Council of Constance declared Wycliffe a heretic on May 4, 1415. Then, on the basis of this Council’s ruling, in 1428, 43 years after his death, Wycliffe’s bones were dug up and burned and his ashes were spread along the River Swift, which flowed through Lutterworth, England, where Wycliffe ministered. Wycliffe’s writings were also banned by the Council of Constance in 1415 and were burned wherever they were found. Why would a church council meet to declare someone a heretic 30 years after his death? 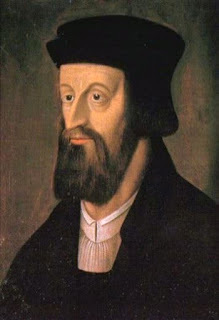 In this case, it was because of the popularity of a Czech disciple of John Wycliffe, Jan Hus. Hus had been a popular preacher in Bohemia, the Czech Republic, since 1402. He preached against the moral corruption of priests, monks and bishops. He later preached against indulgences and the hierarchy of the Catholic Church, including against the Papacy. He believed in preaching sermons in the language of the people, using vivid illustrations and clear language to make the message both understandable and memorable. The Council of Constance met for years to deal with a number of very difficult issues in the church. The church had to deal with the claims of three different men who called themselves the Pope and had no patience for a godly Czech preacher who was airing their dirty laundry and preaching the true Gospel in the language of the people. So, the Council unfairly tried Jan Hus, condemning him for some things he never even taught. Jan Hus was accused of being a disciple of John Wycliffe, an arch-heretic, but Wycliffe had not been officially condemned as a heretic, so the Council of Constance had to condemn John Wycliffe on May 4, 1415 before it could officially begin its trial against Hus on June 5, 1415. On July 6, 1415, Jan Hus was burned at the stake as a heretic. He died singing Psalms and crying out "Christ, son of the Living God, have mercy on us!" The first development came from 1452 to 1455, as Johann Gutenberg printed the first books on his new printing press: 200 copies of the two-volume Gutenberg Bible. The printing press came just 40 years too late to spread the writings of John Wycliffe and Jan Hus before they were condemned and burned. Thankfully, copies of their writings did survive and were later printed and distributed. 1. The Medieval Latin Vulgate had translated Jesus "repent" in Matthew 4:17 (“Repent, for the kingdom of God is at hand”) as “Do penance.” The Greek word Luther read in Erasmus’ New Testament manuscript did not call for doing acts of penance to work off sin but for a complete change of mind and heart, a conversion. Repentance is not the doing of works to atone for sin but the conversion of the soul to God. 2. The Medieval Latin Vulgate had translated Romans 1:16 to say that the Gospels revealed the justice of God, instead of the righteousness of God. Luther was teaching through Romans and he was frustrated by trying to understand how it was good news that God’s justice would be revealed, since God’s justice would condemn him. When he read the Greek and understood that Paul meant righteousness and not justice. 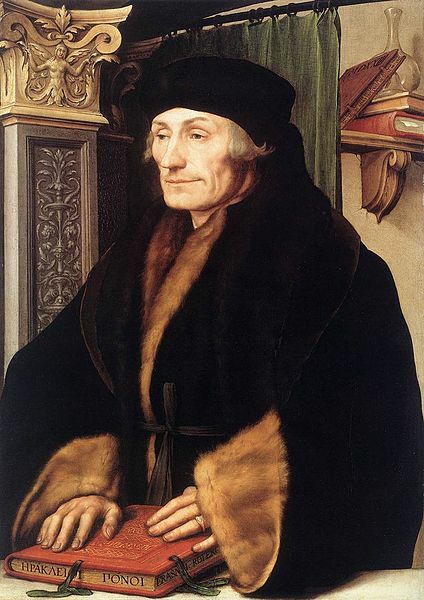 So, do you see how important Erasmus’ Greek New Testament was when it was published in 1516? By helping Luther better understand repentance and righteousness, it saved Luther and gave him the Gospel to proclaim, which would fuel the Reformation and change the world. This is why I think this is actually the more important 500th anniversary, because without the Greek New Testament in 1516, you don’t get Luther’s salvation and the 95 Theses in 1517! The Reformation, more than anything else, marked a period of time in the life of the church when the Word of God was restored to its central and foundational role. After having been lost in obscurity and buried under church tradition and corruption, the Word of God was restored, elevated, preached, taught and lived by the church for the first time in a widespread way in many centuries. The Bible is the breathed-out word of God. It makes us wise for salvation, as it did for Luther and for millions of others. It is God’s means of teaching us, reproving us, correcting us and training us in righteousness, that we may be thoroughly equipped for every good work. So let’s continue to read the Bible, study the Bible, believe the Bible, obey the Bible, teach the Bible and preach the Bible, for this is God’s Book and it is the only sure and infallible guide for our lives.